5 of our 8 trail camera deployments (a 9th is planned) are targeting unscaled hickories, stubs and live trees that show signs of damage or decline. The main goal is to capture images of Ivory-billed Woodpeckers by identifying potential foraging trees and targeting them in advance of their being scaled (a long shot but the best strategy I can think of). A secondary purpose, especially with targets that already show some scaling, is to test my feeding sign hypothesis by documenting work by Pileated Woodpeckers and Eastern gray or fox squirrels (a much easier task). These are the only other local species that have the capacity to remove large quantities of tight bark from the boles of mature living and recently dead trees, though I suspect this capacity is limited. 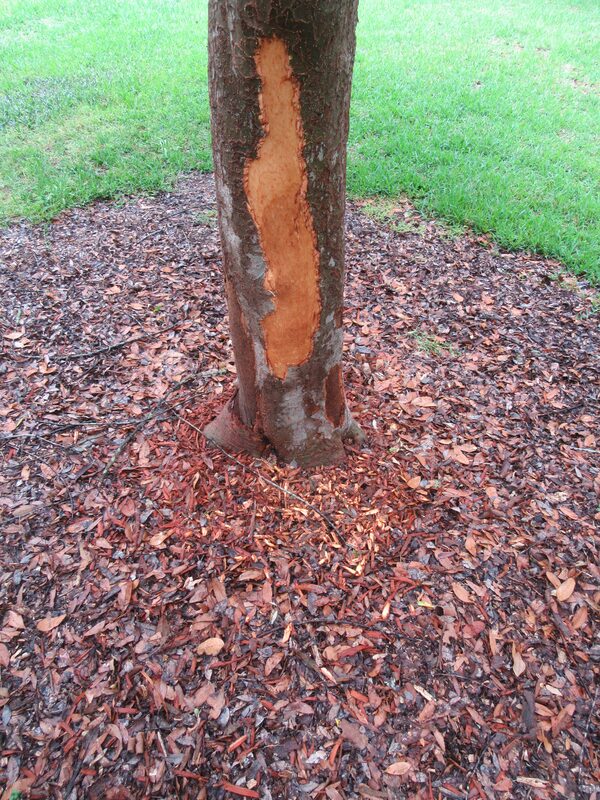 Results from two deployments, one on a still living but compromised and extensively scaled hickory (4/29-6/6/2018) and the other on a sweet gum stub (5/3-6/4/2018), suggest to me that neither Pileated Woodpeckers nor squirrels are the source of the initial, extensive hickory scaling. Part 1 will address Pileated Woodpecker activity on the hickory, followed by a brief discussion of my visit to the search area from June 6-11. Part 2, which should be up within a week or so, will focus on squirrels, especially their activity on the sweet gum stub, which I think is analogous to the Pileated Woodpecker activity on the hickory. These are preliminary findings that may be contradicted by data obtained in future, but thus far they support the suggestion that Ivory-billed Woodpeckers are the source of the initial scaling. Our PlotWatcher Pro trail cameras are dedicated time-lapse (as opposed to motion- activated) units. We set them to capture images at 20 second intervals, approximately between sunrise and sunset. The proprietary software makes it possible to create QuickTime movie versions of the time-lapse stills. The QuickTime versions are worth watching and are illustrative of behavior, but it’s important to remember that they are compilations of still images, not actual videos. Thus, it’s also worth stepping through them frame by frame. This will be an image heavy post but with a lot of analysis. I hope you’ll stay with it. I am not planning to do posts on every review of every trail cam deployment but will post results that I think are a relevant or interesting to readers – PIWOs and squirrels spending time on scaled areas or removing bark, most or all woodpecker hits, mammals that are infrequently seen, identifiable birds, but not squirrels running up and down tree trunks. Before turning to a discussion of the trail cam imagery, I’ll take this opportunity to restate and elaborate on my hypothesis. The imagery and discussion will be familiar to some readers, but I hope the new data will shed additional light, even for those who know the material. The tree on the home page (shown below) is one example. Numerous insect tunnels, some with signs of having been expanded by woodpeckers, must be visible. The appearance of the scaled areas is such that I can recognize older work even in the absence of chips. Because standing hickories (in drier areas at least) are slow to decay and the bark can remain tight for years, older examples persist, and I’ve found many of those over the years. The hypothesis is founded on Tanner’s descriptions of scaling (although bitternut and pignut hickories were absent from the Singer Tract) and on the anatomical characteristics of Campephilus woodpeckers versus those of Dryocopus or Melanerpes, which appear to lack the physical capacity to do this type of work or do it extensively. The characteristics of hickory bark – chemical composition, strength, tightness, and thickness – are also central. I think the same limitation applies to squirrels, at least on hickories. This is not to exclude squirrels and PIWOs from coming along after the initial scaling and expanding it. It recently struck me that grain may play a major role in limiting Pileated Woodpeckers and squirrels from scaling on hickories. Both species seem to follow the grain when stripping bark. Bitternut and pignut hickory bark differs from that of many bottomland hardwoods in having criss-crossed grain, making it considerably harder to remove, except in narrow strips like these, presumably removed from the target tree by a PIWO last year. Based on the recent observations, PIWOs are more likely to dig through hickory bark to reach the sapwood than they are to scale it. I suspect it’s the case with the presumed 2015 PIWO “scaling” on hickory shown below, which is the only example of that type of work I’ve found. The differences may appear subtle in the photo, but they are more pronounced in situ; the work is patchy and discontinuous, and there are few or no exit tunnels. The chips at the base of this tree were small and included sapwood, indicating that this was actually shallow excavation with associated bark removal, something that is often and easily confused with true scaling. Since 2013, we have found approximately 20 hickories that appear to have been recently or freshly scaled. Below are additional examples, plus some that were presumably several years old when photographed. In the case of the tree on the home page, the scaling was very fresh when found. I have not found any recent looking work of this type since March of 2015, though Phil found some last year that were probably scaled during 2016; one of these is the target tree in the sequences shown below. Steve Pagans has found several examples, but I’m not sure of any recent ones. Note the expansion of the exit tunnels, which makes it evident that woodpeckers have been active on the scaled surfaces. Suspected Ivorybill Scaling on an older hickory snag. Work goes from near the base to near the top. Atypically, some of the work at the base appears to be more recent than the rest. Scaled hickory, 2013. Photo by Steve Pagans. Suspected Ivorybill Scaling on a Hickory, 2013. Photo by Steve Pagans. More scaling, same hickory, 2013. Photo by Steve Pagans. A Cerambycid infesting the trees has been identified as Parandra or Hesperandra polita, a medium-sized, bole dwelling species with a 3-5 year life cycle. H. polita remains, apparently of 2 adults, were found in one of the ivorybill stomachs examined by Cottam; it was collected in West Carroll Parish, August 19, 1903 and is referenced by Tanner. The adults of this species remain under the bark for some time after metamorphosis. There may be additional subtle features, including chip characteristics and general appearance, that are relevant to other tree species and may be indicative if not diagnostic. A very nearly dead sweetgum, which had an intriguing cavity, from the old search area, is one example. Over the course of this deployment, Pileated Woodpeckers were photographed on the target tree on 10 of 36 days, sometimes briefly and sometimes for periods of over 20 minutes. On some days in the latter part of the deployment, intervening foliage partially or fully blocked the lens, so it is possible there were additional visits. The camera is trained on the base of the scaled area, which extends to the broken top of the bole, and some of the sequences make it clear that pileateds are visiting the upper part of the scaled area as well. Phil Vanbergen found this tree last season; it is still living, although the sapwood is already somewhat punkier than what I’ve found on many longer dead hickories. The first important point is that very little bark was removed over the course of this deployment, despite considerable time spent by Pileated Woodpeckers on the scaled area. The first two images are from the first and last days of the deployment for purposes of comparison. The new work is so minimal that it is only noticeable in the field upon close examination of the edges. Pileated Woodpeckers were photographed on May 1, May 3, May 8, May 12, May 21, May 25, May 28, May 30, June 1, and June 4. A Hairy Woodpecker was captured on April 30 and on May 12. There were no squirrel captures on the scaled area. Individual frames and time-lapse films (when birds were present for more than a couple of captures) of the Pileated sequences follow. If you choose to watch/step through just one clip, I suggest the one from May 28, in which two birds are present, but viewing all of them will provide a better sense of what took place. Bark and Sapwood Chips at Base of Live but Decaying Hickory. Presumed Pileated. The same appears to be the case for the presumed Pileated “scaling” on hickory in the preceding section. It’s unclear what the woodpeckers were seeking in terms of food, since there is no evidence of current or recent Cerambycid tunnels. In any event, the sequences give evidence of what Pileated Woodpeckers do on hickories, and just how inefficient they are at removing bark. The trail cam captures validate my prediction that the source of this most recent work is Pileated Woodpecker. Thus, we have documented multiple instances of Pileated Woodpeckers foraging on trees suspected to have been initially scaled by ivorybills. None of the imagery thus far shows pileateds removing bark rapidly, efficiently, or extensively. 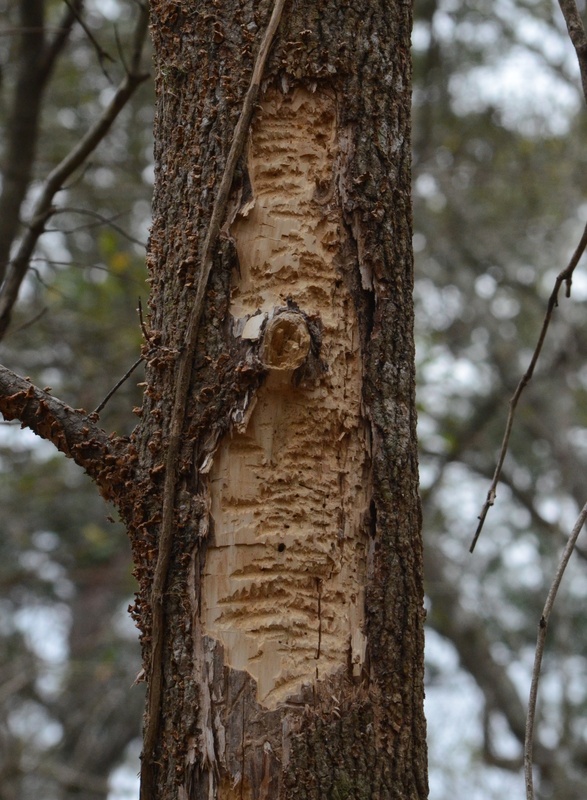 Such bark as they do remove is from areas that are already compromised, although I have found a single example of hickory bark presumably removed solely by a Pileated Woodpecker; it differs markedly from what I’ve hypothesized is Ivory-billed Woodpecker work. While it is difficult to prove a negative, the data gathered thus far suggests that Pileated Woodpeckers do not or cannot extensively scale tight bark from hickories. I suspect they lack the ability to do so. While these trail cams have limited usefulness, except at close range, all of our cameras are close to their main targets. They are positioned close enough for me to recognize lizards and even insects on the trunk but not identify species. Identification problems can exist for small birds too. I suspect the bird in the image below is a Brown Creeper, though I’m prepared to be corrected as it is so poorly resolved. If it is a Brown Creeper, it would be the latest record for the species in Louisiana. And this series shows what appears to be a bobcat, at the lower right. Nothing strongly suggestive of Ivory-billed Woodpecker was seen or heard – no ambient sounds or responses to ADKs. Tommy Michot joined me on Saturday, Sunday, and Monday morning. We deployed the 8th trail cam, aiming it at the bole of a sweet gum snag that has a scaled area; I suspect Pileated Woodpecker was the source, and squirrel is also possible, but the decay state is within the range Tanner associated with ivorybill, so this will be a long-term deployment. Low water made it possible for us to explore some previously unvisited areas. Tommy did several stakeouts where Matt made the recordings this year and where I heard wingbeats and had a possible sighting. On Sunday evening, he observed a Pileated near the sycamore roost where I photographed one in April, and we watched it flying away from the roost on Monday morning. No wingbeats were audible in either encounter, as would be expected for Pileated Woodpecker as opposed to ivorybill. Temperatures reached the 90s by noon every day, depressing avian activity and making fieldwork unpleasant. There were heavy rains on the afternoon of Sunday, June 10, so the 11th was particularly challenging in terms of heat, humidity, and suddenly high water levels. I had a close encounter with a cottonmouth that dropped from a tree limb within a foot of my head, landing in a slough that had been dry the day before. One personal highlight was the abundance of chanterelles, especially after Sunday’s rain. I came home with several pounds, though transporting them was a challenge, and I couldn’t keep them clean. Despite a little grit, they’re delicious. Here are some additional photos. There’s one new example of extensive bark scaling from the upland area shown in detail; it is interesting, but I would not consider it highly suggestive. There was also some recent scaling on a sweet gum that may be more suggestive. I was using a rented 4/3rds camera and a lens with an effective 200-800 mm reach. I had trouble adjusting to the electronic viewfinder, but it was good to get a closer look at one of the cavities found this season. I also found feathers from a Pileated Woodpecker that was presumably recently taken by a raptor; this was in an upland area within 50 yards of where I parked. This is the first time in all my years in the field the that I’ve found PIWO remains. Stay tuned for Part 2. Like this one, it will initially be password protected so that colleagues can review it before publication. I wanted to let regular readers know that I recently completed my final visit to the search area for the season. I am in the process of reviewing trail cam cards and am planning a couple of posts on the results from two of them. The first of these will also include a very limited trip report. There were no captures of possible ivorybills from these two deployments, but I think the posts will be of interest. They will be password protected pending review, but I will make them public as soon as possible. Expect the first within a week or so. This approach has confused several readers in the past. Unfortunately, it is the most efficient way to get my colleagues’ pre-publication feedback. My apologies in advance.